Dressing for the outdoors - keeping warm. Some children have no problem with wearing extra coats/fleeces & hats from our supplies. I hate being too hot & would far rather be cold & add more layers than be stuck in the heat but when it comes to being outside in our cold weather I like to be nice & warm. I wear about 3-4 layers for being outside every morning & usually have ski trousers on too. Some years the children are better prepared for the cold than others ans some years they are still wearing very light, thin coats despite it being very cold. 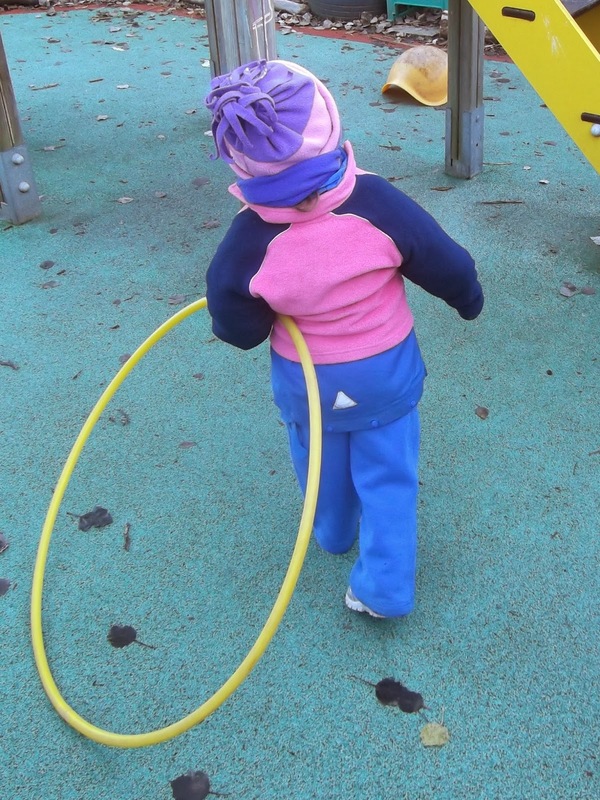 Last week we had a trip to Peatlands Park & all the parents were reminded to wrap the children up as warmly as possible, it was great to see children wearing good thick winter coats, leggings & tights under their trousers & extra tops under their coats. It made me think that really the children could be dressed like this everyday in the colder months as we are only outside an extra 40 minutes on the day of a trip. On the days we spend the whole morning outside it is heartbreaking to see young children starting to cry because they are cold & this is not anyone's intention - I do not go out of my way to make children miserable. Even worse is when it is 2-3 children who are cold & unhappy whilst the majority are dressed more warmly & having fun playing outside. We can't just decide to bring everyone inside because a tiny minority are cold. Luckily this year, we have extra staff so it is possible to send those very cold children inside for a few minutes to play some games & warm up before coming out again. We also ended up layering them up with any extra clothing they had in their spare sets of clothing - we do have extra fleeces & coats but some children will only wear their own clothes. The best clothing guide for outdoors in our climate that I have come across is from Muddy Faces. The key is layering - I keep saying it's easier to take layers off when we get inside than to try adding them when outside. People often talk about layering clothing, but what does it actually mean and why is it important? Layering clothes is a system that can be added to and removed to sustain a comfortable temperature. Air is trapped in and between the different layers and helps provide insulation. More importantly outer layers can be removed if an individual is feeling too hot, allowing the body temperature to drop to a comfortable level. By keeping a base and mid layer on this prevents the body temperature dropping too much, when outer layers are removed. A comfortable body temperature can prevent too much sweating during physical activity which can cause people to become cold when the physical activity stops.Frequently children have too much or too bulky clothes on which prevents them from moving easily and detracts from their ability to participate in outdoor activities. So getting the layers of clothing right really helps children to access sustained outdoor provision and helps adults to support this. Ideally for being outside November - February in our climate I'd like to see all the children wearing a long sleeved vest or t-shirt, their school t-shirt, sweatshirt, a zip up top & a good warm coat. They should also be wearing leggings or tights under their trousers & good thick woolly socks - wellies can be very cold without thermal socks or fleece linings. Unfortunately a few years ago our school uniform supplier started selling school coats, they are fleecy waterproof jackets & are really not warm enough for November - February weather. I'd rather see a child in a thicker coat during these months & I would seriously ask parents to consider if a coat is truly warm enough if the child is wearing it from September right through to June. Warm socks tucked over trousers. We are hoping that our PTA will help to finance buying good quality snowsuits for us to use in the colder months but until then I'd love to see all the children layered up for the next few months. I would also say that in the last 3-4 years it has become much easier to get affordable good quality winter clothing & footwear for young children. So please bear in mind that there really is no such thing as bad weather just inappropriate clothing! I hope by now anyone who follows this blog knows what Bottle Babies are & has heard of the book that 'spawned' them - Carol Stock Kranowitz's The Out-Of-Sync-Child-Has-Fun. They have been such a part of my setting now for a year that I take them for granted as part & parcel of every day outdoor play but this year the class doesn't go to them as naturally as the children did last year. 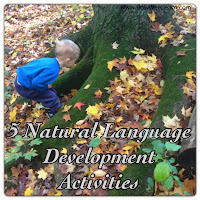 It takes an adult to initiate play with them and then the children engage with them. 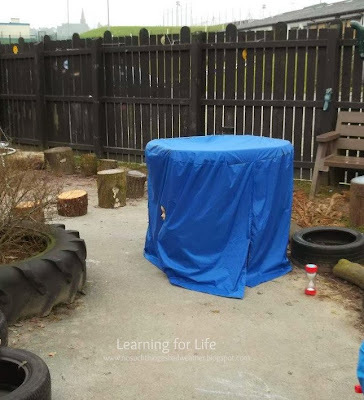 I think a big part of this is that this class are just too busy elsewhere in the playground, this is a class that uses every part of the space. They spread themselves all over the space & particularly enjoy the 'forest area' - which used to be the grass area & then the mud area - now it is covered with bark chippings & leaves & feels very natural & provides endless hours of play possibilities for then class, with pine cones, hickory nuts, spanish chestnuts, gumballs, bark chippings & leaves. 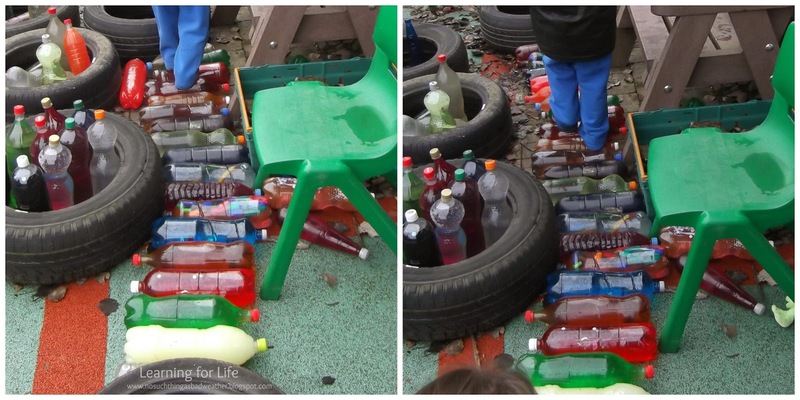 The children enjoy 'cooking' with these loose parts, moving them around the area & playing in the 3 willow domes. Part of our forest area. However when they were taken out & lined up on a seat, some of the children then lay them down on the ground & one child started to walk on them. This particular child has cerebal palsy & it was quite incredible to watch him persevere at mastering this quite difficult task as it is hard enough for him to walk on a flat, even surface with out moving over wobbly Bottle Babies. Other children then attempted this too & they could be heard shouting to each other 'arms out for balance'. 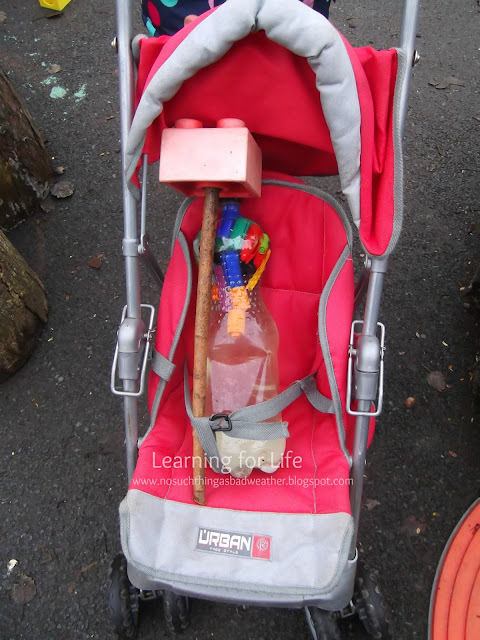 They even took them for a walk in the prams & one girl created an umbrella with a stick & giant Lego block for the Bottle Baby. I think it is amazing that Occupational Therapists who are working with several children in the class have written the bottle babies into the children's educational work plans as they can see the benefit of these great free resources for developing proprioception. But best of all every child can fun with them without even realising how beneficial they are. Children using a timer to regulate turns in the den - all child initiated. This is why teachers push for children to be as independent as possible. A recent conversation at the hairdressers got me thinking & challenged me as a teacher. I was chatting with another customer about Christmas presents etc. and she was worrying that because her 5 year old was getting a doll & pram she would be a target for others who were getting more grown up presents like iPads & laptops. I thought it was so sad that a 5 year old could be considered too old for toys, I was nodding away in agreement with her as we lamented the loss of childhood and then she said something that stopped my nodding. She commented that once her child had started school last year they had forced her to grow up by pushing for her to be as independent as possible. This really made me think. 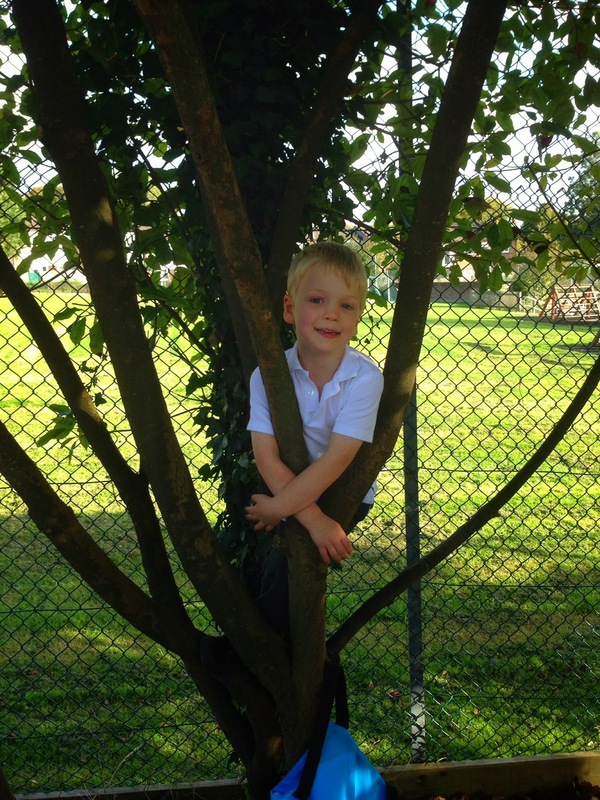 As a nursery (preschool) teacher my aim is to make the 3-4 year olds in my class as independent as possible in their time with me - I hadn't ever thought that a parent could view this as forcing them to grow up too quickly. As we chatted some more & I started to explain that when there are 30 in a class teachers have to have independent children, she then added that she felt staff in schools didn't care anymore as she had seen a child come out of school with their shoes on the wrong feet & jumper on back to front one day. Again this gave me food for thought, most days a least 3-4 children will go home with their school jumpers on back to front & not because we don't care but because, this shows they put it on all by themselves. We would gently tell a child to swap their shoes over if we notice they are on the wrong feet but again it proves they put them on by themselves. As I thought about this conversation later that evening it occurred to me that the key to this perspective was that this mother didn't know the reason why these small things were happening. We hold an information evening in June for all the new parents & during this time I spend quite a while explaining why we want their very small children to be independent. We ask that they wear velcro shoes or slip ons so that they can take their own shoes on & off, in my setting they wear their wellies in the sand & on the forest area & usually there are a minimum of 26 children & 2 adults, so it's not feasible for us to be taking shoes on & off & tying laces for 26 children. I like to think when they are told why, it makes sense to the parents. I also talk about how they will see their child come out of nursery with their jumper on backwards & that it doesn't mean we don't care, it is a badge of honour to be celebrated. I love to hear a parent say to a child with a jumper on back to front 'Oh you put your own jumper on, well done'. My role as the teacher of young children is to make them independent curious learners, I shouldn't have to be with every child or directing them all the time for the class to run smoothly. There is nothing more rewarding as a teacher to step back & watch a class of young children move around the classroom in a purposeful manner, engaged in learning with little or no adult direction. I love to see a child get the egg timer & set it on a table & negotiate their turn with a particular resource. When we have students or staff new to the nursery, it can take them a while to appreciate that it does no one any favours if the adults do everything for the children. On an average day there are 11 learning stations within the classroom & 2 adults so it would impossible to be in control of all areas anyway. I hope that by communicating openly with parents why we do things the way we do, they can understand that we are not forcing their children to grow up but instead equipping them with the tools to be independent, active learners for the rest of their lives. Delighted to have Unnur, my colleague from Leikskólinn Stekkjarás in Iceland guest posting for this OPP. Here she shares how the children in her school enjoyed the first big snow fall for this year earlier this week. kids came up with a lot of ideas of what to do. Some set up a business and sold some ice cream of course. Some made snow houses with some help of tyres and planks and some made a den with the trees we have in the garden. Some made dens & houses as the snow fell. One of the children had turned up late this morning and brought with it a thoturass or bum board. With only one to play with all the children got in line so everyone could have a go. When there is only one bumboard everyone had to wait & take turns. 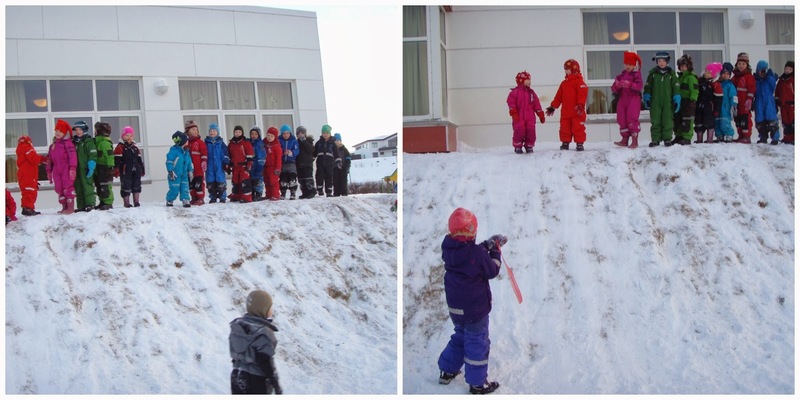 In the afternoon when we went out again, we found some more sleds and some of the teachers got to try this fun thing as well. It was fun riding down the hill with a teacher! We had fun making a snowhouse and in the making of that we found out that by throwing snow on the window we could draw on it all types of things. 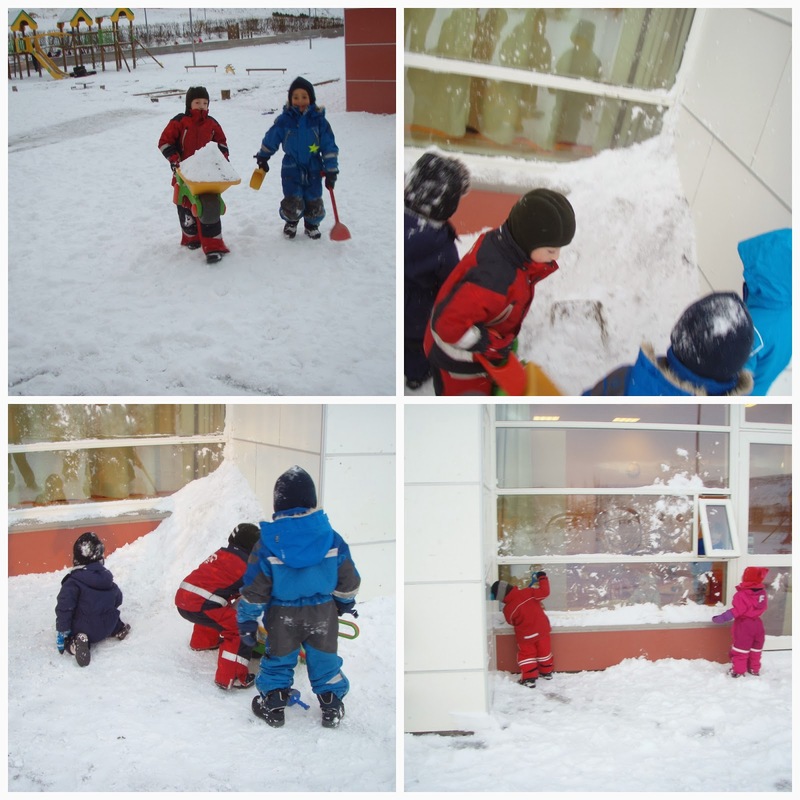 Making a snowhouse & discovering we could draw on the windows with the snow thrown at it! All this makes our little snow fall this week seem more like frost! I was delighted to see so many new blogs linking up in the last OPP & I hope they continue to join in over the next few weeks too. 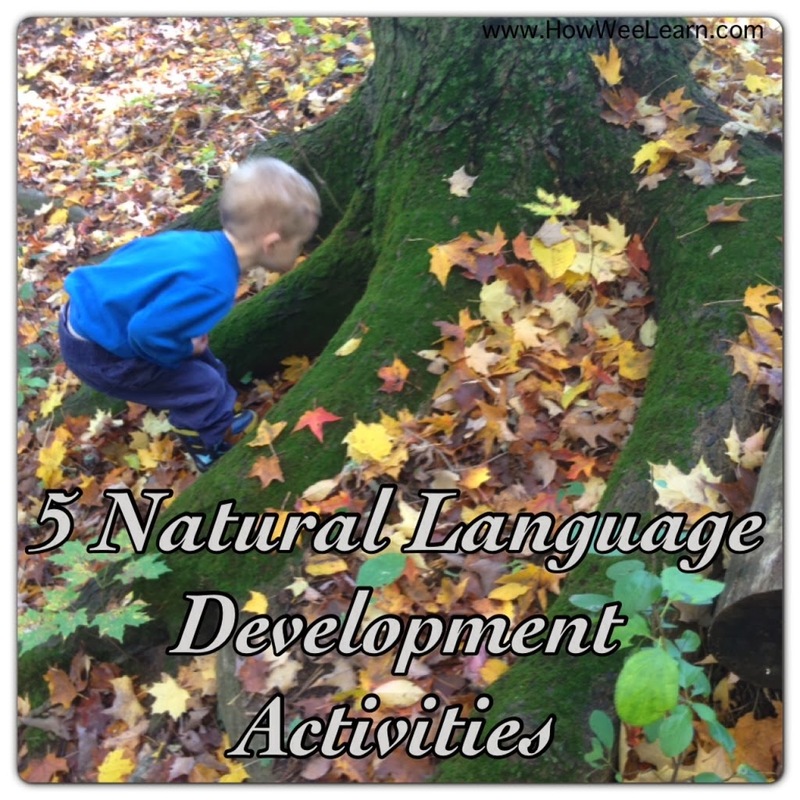 My favourite post was from How Wee Learn on using nature to help develop language. As anyone who spends time with young children soon learns, if you give them a context for new words they will grasp them much quicker & be able to use them in other scenarios too. We'd appreciate it if you included a link back to this post (either in your post or sidebar) to help us spread the word about the importance (and fun!) 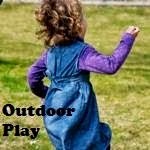 of outdoor play! In return, we'll gladly further share your post on Facebook/ Twitter/ Pinterest.Please feel free to grab the Outdoor Play Party button from the sidebar and/or include a text link back. The plan had been to visit 'Bear Woods' on a weekly basis but then life got in the way! We have had parties & staff off sick so we only got back for a visit last week, almost a month since the last time. This time we took some snack up with us to have a picnic on the grass - this was to practice for the next couple of weeks when the class will head off on trips to Sperrinview & Peatlands. It's always good to get used to eating snack all together, as we usually have a cafe style snack that the children can just come to when they are hungry. We also decided to bring some more bottle babies up to live in Bear Woods, some children volunteered to carry them all the way up the hill from nursery - it was hard work! Once in the woods, the children spread out in the space, some like to roll down the hill, others play with the food & trucks we have left up there. Then some discovered it was fun to lay the bottle babies down flat & try to walk along them like a path. Mrs Carson helped some children plant some seeds in 2 tyres we had brought up. After a while the bell for break time rang in the main school & soon there were lots of bigger children over at the fence to speak to their younger brothers & sisters. We then walked back down to nursery to have a short play time again before going inside for story & lunch time. 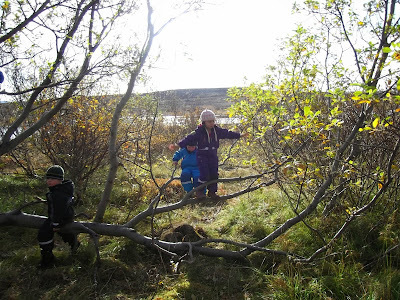 Outdoor Play Party - Norwegian influences. I am so delighted to welcome Erin from The Usual Mayhem back to the OPP & to welcome a new co-host, the brilliant Leila from Mud, Mud, Marvellous Mud. It's always great to connect with like minded bloggers across the globe & for us all to able to host a collaborative linky every fortnight is a honour. In 2008 I was very lucky to be able to spend a week working in an outdoor Kindergarten, in Eikefjord, Western Norway. At the time the kindergarten was one of our Comenius partners & I received funding from the British Council to go on a job shadow of one of the outdoor teachers, Susette. The 5 days I spent in the kindergarten from 8 until 4.30 had an amazing & far reaching impact upon my practice. I can remember coming back to my own setting & deciding to make so many changes all at once! The biggest thing I believe I took back from that time was to stand back during outdoor play & allow the children to take more of a lead, before this experience we would definitely have been more 'hands on' & in a more 'teacher' mode during outdoor play. 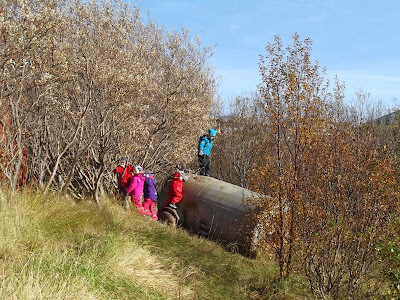 I can actually remember some of the Norwegian teachers laughing at the fact I was in the sand pit with the children, they saw that as interfering with their play. I did a lot of observing that week & I saw that the adults may have looked like they were standing around when in fact they were watching all the play very closely & were ready to step in & help it develop if necessary. A student I have this year,who was a parent volunteer last year was telling me that that was the hardest thing for her to adjust to when she started in the class - she was used to being 'on' when around young children & entertaining them, whereas, she noticed immediately that the adults don't do that in my setting. When I look at the photos I took in 2008, they all look like the kind of play I might see any day in my class and yet 5 years ago it seemed very different to me. The children didn't need a lot of resources to have fun, they played with whatever was around them - loose parts long before I ever heard the term -sticks, gravel, water, mud etc. 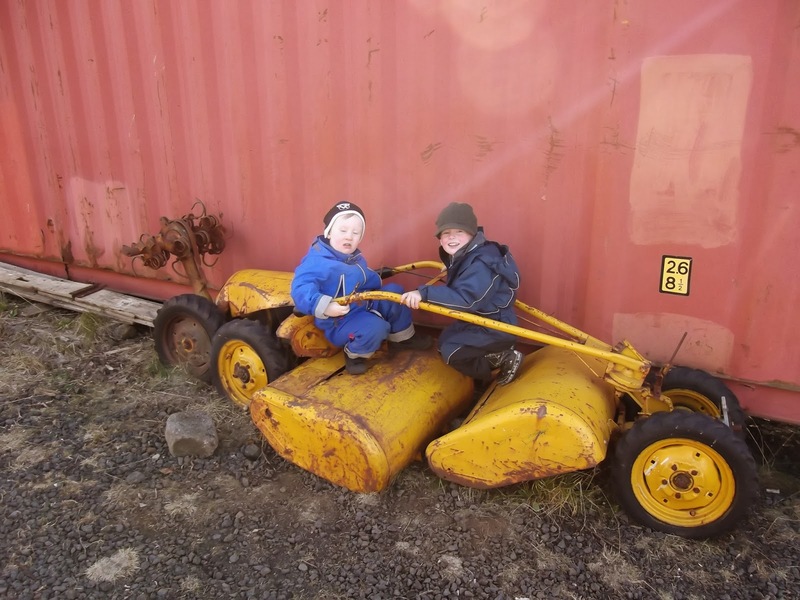 When I travelled to Iceland last month with Fafu I was fascinated by how much some of the other adults were amazed by the perceived lack of adult intervention in play & in fact it had become a standing joke to play 'spot the adult' as this was not always possible in some playgrounds or areas. This aspect didn't really trouble or me or stand out to me, as I had seen it in Norway & I also know that on any given day in the forest it would be possible to come across a group of children in my class on their own with no adult in sight. It made me realise how far my own practice has come in 5 years & in fact when I was speaking to one of my colleagues back home during the Iceland trip, she said 'Oh flip, what are you going to have us doing now?' as she well remembered how much I wanted to change when I came back from Norway! 5 years later, quite similar play in Iceland. 5 years ago a lot of the risky play I saw did challenge me but now it is definitely part & parcel of everyday play in my setting & some days when the children are all wrapped up in their rain gear I can well believe that I could be teaching somewhere in Scandinavia!! Even though the past week has been very chilly as Autumn moves closer to winter for us, it was great to see so many posts linked up & to see people are trying their best to have some outdoor fun no matter what. My favourite post from them all was from Jenny over at Mummy Mishaps of her son sitting up a tree! I loved that it's the first thing he asks when he gets out of school & even better that he is allowed to get up there in his uniform!